Are you planning your next trip? Or you need help simply to find a flight or accommodation for your business trip? No worries. There are many travel booking apps nowadays available to save you time and money when it comes to these issues. With the right booking app on your phone, you will able to search for accommodation and flights all around the world while saving money at the same time. We looked and we have one amazing travel app to help you with this. Let’s see what the app is about. What is Hotel Discounter all about? 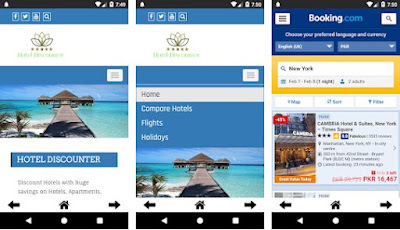 The Hotel Discounter is developed for both Android and IOS users as one amazing travel booking app for accommodation and flights all around the world and all that inside one app at the best prices as possible. No matter if the user is looking for a hotel, motel, apartment, villa or a flight for his vacation or business trip, on the app he will discover last-minute advanced booking deals on accommodation at the price that suits him the most. Users will be able to save money and time organizing their next trip while being completely safe and secure on this amazing booking app. This travel booking app and the features offered on it will allow users to effortlessly and efficiently plan his vacation or business trip while saving time and money in the same time. With the app, each user has a chance to search and discover thousands of discount hotels, motels, apartments, and villas with amazing savings of up to 80% all available in the app. Worldwide offers can be discovered on the app with many special offers for the user from different popular accommodation providers at great prices guaranteed without any booking fees too. Travel agents and major airline agents are available on the app with amazing last minute offers for travellers, offering the user completely safety and security with the ABTA and ATOL protection when the user securely checks out on the website. Great unbeatable deals on flights and accommodation and package holidays as well are available on the app and the user will easily find last minute deals on hotels, motels, apartments and condos. The accommodation comparison page allows users to compare the top providers to easily choose the best deals at the best prices as possible to save money and time. Download it for free on Google Play and App Store to discover unbeatable deals on flights and accommodation!